Alpine Low Voltage Transformers Transformer with Photo Cell and Timer. 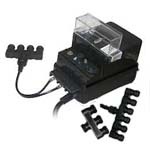 Enhance the beauty of any water garden and add intrigue with the Alpine Multi-Light Transformer with Photo Cell and Timer. Adjustable timer for settings of auto, 4, 6, or 8 hours which work with the photo cell.